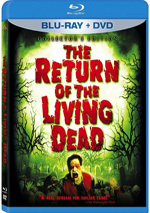 In this third and final shocker in the legendary trilogy from writer/director George A. Romero (Dawn of the Dead, Night of the Living Dead), a small group of scientists and soldiers have taken refuge in an underground missile silo where they struggle to control the flesh-eating horror that walks the earth above. But will the final battle for the future of the human race be fought among the living or have they forever unleashed the hunger of the dead? Lori Cardille, Joe Pilato, Richard Liberty and Howard Sherman star in this controversial classic with groundbreaking gore effects by Tom Savini and featuring the most intense zombie carnage ever filmed. 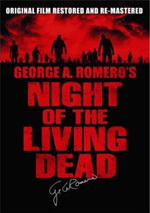 As a connected series of films, the original zombie trilogy George Romero launched with 1968’s Night of the Living Dead seems unusual. That’s because it appears that none of the flicks share the same setting or characters. Part of that stems from the long span of time that encompassed their creation. 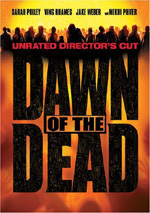 The second in the series - Dawn of the Dead - didn’t show up until 1978, while the next chapter - Day of the Dead - only got made in 1985. While the three could have featured some of the same folks, the many years between films likely made it more difficult. Based on the titles, you might assume that all three add up to one 24-hour period of time, but that’s not the case. Actually, the time span from the events of Night to those of Day seems ill defined, but it’s clearly been weeks, if not months or years. Day opens with virtually no exposition or discussion of those prior events, but it doesn’t really need that information. We know that zombies walk the earth and have essentially taken over from the living. Clearly the undead picked off the ranks of the latter substantially during the first two flicks, for we find only sparsely populated areas in Day. Day takes place in Florida, and the film opens with a sequence in which we see the zombie-infested streets as some folks try to find evidence of living people. They fail and head back to their base, an underground missile silo compound. Some of them want to give up and retreat to a deserted island to enjoy their remaining days, but Sarah (Lori Cardille) feels they need to continue the fight for humanity. We quickly learn that the silo contains two separate factions: military personnel and scientific types. Much friction exists between these two sides. The former just want to duke it out, while the latter attempt to find a way to solve the problem. Called “Dr. Frankenstein” by his detractors, Dr. Logan (Richard Liberty) conducts experiments to domesticate the zombies and take control of them. Head military dude Captain Rhodes (Joe Pilato) grows impatient and wants to terminate these studies that he perceives as a waste of resources and time. Eventually the two sides come to a head, and not surprisingly, some undead become involved. That’s not a great synopsis, but Day of the Dead doesn’t feature much of a coherent plot. Is the movie about the battle to stop the zombies? Is it about the tension between different bands of survivors? Is it just a lot of nonsense so the filmmakers can indulge in some graphiczombie attacks? Methinks the latter seems like the most appropriate classification, for Day presents a muddled and unfocused story. The film starts at a snail’s pace and never quite recovers from that slow opening. When people go to see a Dead movie, they do so because they want to see humans battle zombies, but Day skimps on that action. Indeed, nothing really occurs until the flick’s last act, and by that time, it’s way too late for us to care. The absence of zombie fun wouldn’t become such a fatal flaw if the characters themselves seemed substantial, but unfortunately, Day presents nothing but generic stereotypes. These roles are so thin that I can’t even call them two-dimensional, and the terrible acting makes the participants appear even less rich. What does it tell you about this movie when the most believable performance comes from one of the zombies? As Bub, Howard Sherman takes on the Frankenstein’s monster part, and he makes that undead personality surprisingly honest and engaging. If only the full-fledged humans in the cast could offer similarly fulfilling work. Unfortunately, each one seems either wooden or hammy. In general, the military guys camp it up and act like stereotypical force-obsessed jackasses, whereas the more cerebral sorts come across as flat and bland. Even Liberty can’t manifest much evil genius flair as Dr. Logan; he just appears twitchy and unconvincing. Admittedly, no one goes to see this sort of flick for spectacular acting, but the performances here are so bad that they create a distraction. And since the movie doesn’t deliver the zombie action we crave, the weak talents of the cast become even more of a problem. Of course, the aforementioned somnambulant pacing doesn’t help. For a zombie movie, Day seems awfully chatty, but it never becomes cerebral or thoughtful; all the talk adds up to nothing. By the time the zombies finally do some ripping and tearing, it’s too late. I felt so thoroughly bored by the third act that almost nothing could have redeemed the film, and the flick’s half-hearted and uninspired zombie action fails to entertain. Really, the climax feels like nothing more than an attempt to disgust us. We see the same gross-out shots of zombies who dismember living humans over and over, and virtually nothing distinguishes one of these images from another. The “action” is dull and lacks any form of zest or excitement. And I still haven’t discussed the flick’s atrocious synthesizer/heavy metal guitar score! Day of the Dead ends the original trilogy on a poor note, as it never becomes scary, exciting, or intriguing. Instead, it plods along with dull exposition that culminates in a totally uninspired battle. The undead deserve better than this pointless nonsense. 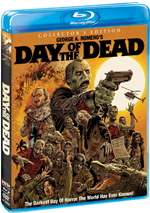 Day of the Dead appears in an aspect ratio of approximately 1.78:1 on this Blu-ray Disc. This was a decent image but not one that excelled. General definition seemed fine. While the film rarely looked razor sharp, it usually appeared reasonably concise. However, wide shots tended to be more than a little on the soft side and could veer toward mild blurriness. I suspect that these issues stemmed from the source photography, but they still created a tentative feel to a fair amount of the movie. I saw no problems related to jagged edges and moiré effects, and edge haloes failed to appear. With a consistent, natural layer of grain, I detected no overzealous digital noise reduction, and print flaws were reasonably minor. Occasional examples of spots and marks appeared, but those weren’t a substantial concern. Since most of it took place in an underground military installation, Dead didn’t feature many opportunities for vivid hues, but the transfer replicated the colors appropriately. These tones came across clearly and seemed acceptably distinct and full. Black levels were deep and dense, and low-light shots seemed reasonably smooth; a few shots looked a little thick, but not to a problematic degree. Given the movie’s age and low budget, I didn’t expect great visuals, but I still thought this one was a bit less impressive than it should have been. Back in 1985, multichannel audio was fairly common, but it wasn’t a given – especially in low-budget flicks like Day. As such, it came as no surprise that Day’s Blu-ray provided a DTS-HD MA 2.0 monaural soundtrack. Unfortunately, the quality of the audio didn’t hold up well over the last 28 years. Speech tended to be somewhat shrill and sibilant; while the lines remained intelligible, they never sounded natural. Music was clear enough and showed passable range but wasn’t exactly dynamic. Effects fell into the same realm. Like the dialogue, these elements seemed tinny and trebly, which could be a distraction. I wouldn’t call the effects terribly distorted, but they didn’t seem accurate, either. Even when I considered the audio’s age, I still thought it fell short of expectations. How did the Blu-ray compare to the 2003 Special Edition DVD? Audio regressed on the Blu-ray in a number of ways. For one, it abandoned the DVD’s 6.1 channel mixes, which I didn’t regard as a terrible thing, as the monaural track here represented the film’s theatrical audio. However, quality took a drop along the way. While I didn’t think the DVD’s 6.1 tracks sounded great, they came across as superior to the reedy, rough mono mix found here. Visuals demonstrated improvements, however. Even with the softness, the Blu-ray looked tighter and better defined, so that made it a step up by comparison. While I didn’t think the Blu-ray blew away the DVD’s visuals, it did look better. The Blu-ray mixes old and new extras, and these start with two audio commentaries. The first features writer/director George Romero, actress Lori Cardille, special makeup effects artist Tom Savini, and production designer Cletus Anderson. All four sit together for this running, screen-specific track. Despite my dislike of the movie itself, this commentary seems fun. The participants cover a lot of useful ground, as we get information about alterations from Romero’s original plans for the flick and hear a lot about locations and sets from Anderson. Cardille presents the actor’s point of view while Savini lets us know the secrets behind the gruesome creations. The four also get into some general material and anecdotes as they reflect on their experiences and the movie’s legacy. Almost no dead air appears during this lively and entertaining discussion. Fans will definitely enjoy the chat, and even those of us who think the movie bites should like it. The second commentary presents filmmaker Roger Avary all on his own, and he offers a running, screen-specific track. Avary has no formal connection to Day. The co-writer of Pulp Fiction and the director of The Rules of Attraction, Avary is just a fan with a résumé. He clearly adores Day and he tells us that over and over again. Avary gets into a few moderately interesting subjects like his one contact with Romero, his work with Savini, and his dream about a deleted scene. However, many gaps show up through the commentary, and Avary doesn’t tell us much more than how much he loves the flick. He doesn’t seem all that educated about Day, and he occasionally seems to be under the impression that there were only two movies in the Dead series. Sometimes Avary notes the existence of Night, but other times he refers to the “two” films in the series and presents the impression that Dawn began the series. I didn’t find much to enjoy in this banal commentary. With World’s End: The Legacy of Day of the Dead, we get a one-hour, 25-minute, 26-second documentary. It includes notes from Romero, Cardille, Savini, editor Pasquale Buba, director of photography Michael Gornick, composer/1st AD John Harrison, art director Bruce Alan Miller, makeup effects assistant Dean Gates, makeup effects designers John Vulich and Everett Burrell, and actors Joseph Pilato, John Amplas, Gary Klar, Terry Alexander, Anthony DiLeo, Howard Sherman, Debra Gordon, Mark Tierno and Phillip Kellams. We learn about the project’s roots and development, story/character areas and changes from the original script, cast and performances, sets and locations, makeup and effects, editing and music, the film’s release and retrospective thoughts. With nearly an hour and a half at its disposal, “End” gets more than enough time to explore a wide variety of subjects, and it takes advantage of its length. The show digs into a nice array of areas and does so in an involving, full manner. It acts as a good complement to the main commentary and delivers a solid examination of the film. Next we shift to Behind the Scenes Footage. Subtitled “from special makeup effects creator Tom Savini’s archives”, this 30-minute, 42-second collection offers exactly what its title implies: videotaped footage from Savini’s archives. We see effects tests, makeup applications, and how the elements worked on the set. “Behind the Scenes” could have used some narration to tie it together, but it’s still a cool package of footage. To get a look at one Dead location’s “real life”, we find the Wampum Mine Promotional Video. This eight-minute and 12-second ad shows the film’s main location in its normal state. This makes for a fun archival extra. Another look at that location comes via Underground: A look at the Day of the Dead Mines. It runs seven minutes, 37 seconds and offers info from facility tech Skip Docchio, though most of the piece brings us a set tour from Cult Magazine’s Ed Demko. It’s a decent view but nothing all that memorable. We finish with four trailers, three TV spots and Still Galleries. The latter breaks into four subdomains: “Behind the Scenes” (223 images), “Locations” (49), “Posters and Lobby Cards” (109) and “Miscellaneous” (130). These offer a nice array of images, though I wish the interface offered thumbnails to make the photos easier to explore. I know that Day of the Dead maintains a pretty intense fan base, but I can’t count myself as a member of that club. I thought the flick seemed dull and poorly made in general. The Blu-ray provides decent visuals, lackluster audio and a strong collection of bonus features. The problems with audio make this a flawed release, but it still represents the best version of Day on home video to date.